A long time ago during our grandparents days, the workplace was a different place. Most business communication took place over landlines and in person and documents were all hard copies. The workplace has evolved with social collaboration and rising tech trends. The internet, smart phones, cloud computing, etc. has made it possible for us to work anywhere and everywhere, which has led to collaborate with people on the other side of the world with ease. Now days employees can work anywhere and anytime. Cloud computing and email on our smartphones made working away from the office not only possible but very easy. The workplace has evolved so that employees can focus on getting things done, no matter where they are. Employees are not climbing up the corporate ladder, they’re coming up with their own career paths and following them with different companies and industries. 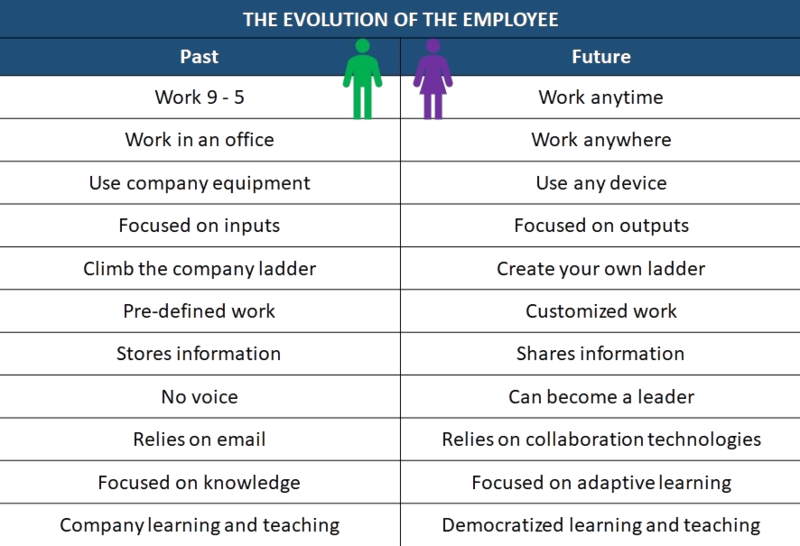 Now employees take their experience from one job and company to the next. Employees in the past did not share information, thinking it meant they had power because they knew something others didn’t. Now days they are encouraged to share information by speaking up and coming up with new solutions. This has led to increased collaboration between employees instead of competing against one another. To be the world's smartest person all you need is your smart phone where you have access to anything you need. The employee's ability to learn new things and apply it to new situations and stay adaptable is far more important and valuable than what you know.